Go-Kaiger Episode Summaries: New Enemies, Old Grudges. Marvelous sees AkaRed in a vision. Possible debut of Kanzen GokaiOh and the death of Walz Gil. The Gokaigers seek out the Megarangers. Kenta has become a teacher at Moroboshi High School and the Gokaiger disguises themselves as high school students and enter the school. The episode guest stars Ooshiba Hayato as Kenta Date aka MegaRed. GoZyuDrill arrives from the future bringing a letter from the former TimeYellow, Domon. The letter tells the Gokaiger they must stop a a certain shrine from being destroyed on October 2nd, 2010. There, on that date, The Gokaiger find the Goseiger and Shinkenger battling. They also meet a boy named Mirai Moriyama. Ackdos Gil’s elite bodyguards Dyrandoh and Zatslig board the Gigant Horse. For not being able to protect Walz Gil, Damaras is imprisoned. Zatslig is attacking and it turns out Ahim has a grudge against him because he is the one who killed Ahim’s parents and destroyed Planet Famille. Author M.F. CalhounPosted on October 21, 2011 October 21, 2011 Categories MC's postsTags 37-41, Ahim do Famille, episode summaries, Kaizoku Sentai Go-kaiger, Kanzen Go-KaiOh, Megaranger, new enemies, Timeranger, tribute episode, Walz GilLeave a comment on Go-Kaiger Episode Summaries: New Enemies, Old Grudges. Go-Kaiger Episode Summaries: Going over Classroom Time to talk about Ahim. Kenta has become a teacher at Moroboshi High School. The Gokaiger disguises themselves as high school students and enter Moroboshi High. Guest starring Ooshiba Hayato as Date Kenta aka MegaRed. GojyuuDrill arrives from the future bringing a letter from none other than, former TimeYellow, Domon. The letter tells the Gokaiger they must stop a a certain shrine from being destroyed on October 2nd, 2010. There, on that date, The Gokaiger find the Goseiger and Shinkenger battling, and they meet a man, Moriyama Mirai. The episode might explain the Gokaiger’s appearance, or cameo, in the recent Tensou Sentai Goseiger vs Shinkenger: EPIC on Silver Screen. Guest starring Izumi Shuuhei as Domon aka TimeYellow. Emperor Akudos Ghil, accompanied by his bodyguards Dairandor and Satsurigu, arrives at the Gigant Horse. He has Damaras imprisoned for not being able to protect the Prince. Satsurigu begins a horrifying attack on the Earth, the same force that killed Ahim’s parents, and destroyed her planet, Planet Famille. 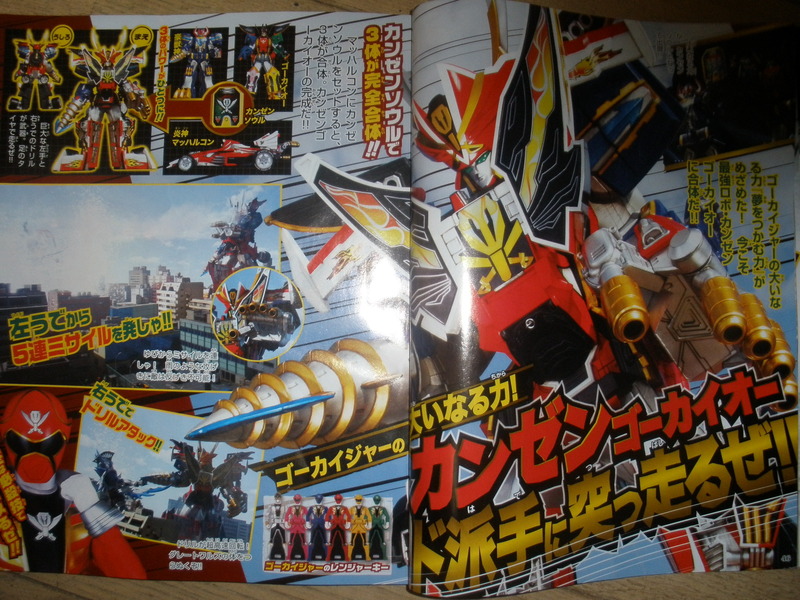 The final fight may be Basco VS Gokaiger, and will have a “big event” occur with Zangyack. I wonder what that “big event” could be? And how come Hakase’s backstory is the last one will hear anything about?! As always, these are rumors, so we’ll just have to wait and see what happens. Although one thing I can say for sure: I still don’t want to think about the series concluding anytime ever! Author M.F. CalhounPosted on October 5, 2011 October 5, 2011 Categories MC's postsTags Ahim do Famille, episode summaries, future episodes, Kaizoku Sentai Go-kaiger, Megaranger, rumors, Timeranger, tribute episodeLeave a comment on Go-Kaiger Episode Summaries: Going over Classroom Time to talk about Ahim. Go-Kaiger October Episode Summaries: Who here’s dressing as a pirate for Halloween? Episode 32: Chikara wo Hitotsu ni (Combine Our Powers) – (10/02) Gai and the others were injured by the true form of Basco. Hakase decides to create a new weapon, borrowing everyone else’s weapons in the process. He continues development on the weapon, but it is only ending in failure. Furtheremore, the Action Commander Shieldon, who can repel any attack with his shield, appears. Although this only causes Hakase to worry more, he gets a hint from the words of Gai and Goro Hoshino, and is able to complete the GalleonBuster at last! Gai’s GokaiCellular is swallowed by the new Action Commander, Zakyura. Gai can neither transform, or fight… The worrying Gai runs into a Delivery Man from a Chinese Restaurant. He turns out to be none other than the former Ryuuranger, Tenkasei Ryou! Luka’s childhood friend and businessman, Cain, will make an appearance in this episode. Action Commander Onenine appears. Furthermore, “Fulfill My Dream, Dynaman” was Kagaku Sentai Dynaman’s ending theme. Yuki Kimisawa who previously played Kamen Rider W’s Kirihiko Sonozaki aka Nasca Dopant will play the role of Luka’s childhood friend. Episode 35: Jigen no Mukou (Dimension on the Other Side) – 10/23 The Gaiark officer, Chirakashizuki appears. In front of the Gokaiger appeared a mysterious robot, whose name was Bonper! Former Go-OnRed, Esumi Sosuke, appears. The Gokaigers end up taking on Chirakashizuki and another Gaiark officer, Babaachuudo, to stop their attack on the Gunman World. However, the Gokaiger fall into a Gaiark trap! There hope lies in… Engine Machalcon! It is also confirmed that Engine #13: Machalon will be voiced by Hiroaki Hirata, best known for his role as Sanji of One Piece, and Wild Tiger of Tiger & Bunny. So, two tribute episodes, and a look into Luka’s past? This is going to be quite the month for the Go-Kaigers! The Gokaigers disugise themselves as high school students and enter Moroboshi High. Guest Starring Ooshiba Hayato as Kenta Date aka MegaRed. A Gai focus episode. Guest Starring Shuuhei Izumi as Domon aka TimeYellow. Ahim’s backstory episode. The Emperor’s bodyguards, who destroyed Planet Famille, appears. Author M.F. CalhounPosted on October 2, 2011 Categories MC's postsTags 32-41, Ahim do Famille, Dairanger, Dynaman, episode summaries, Go-KaiGalleon Buster, Go-Onger, Ikari Gai, Kaizoku Sentai Go-kaiger, Luka Milfy, Megaranger, Timeranger, tribute episodeLeave a comment on Go-Kaiger October Episode Summaries: Who here’s dressing as a pirate for Halloween? Red Mask Comeback: Is Takeru returning in Go-Kaiger? Well, not that long ago, some pics surfaced on Facebook showing Georgette Inaba and her son posing with the Go-Kaiger cast and crew. Inaba is the wife of “former” actor Kaizu Ryousuke, who is best known for his role as Takeru/Red Mask in Hikari Sentai Maskman. Ket me show you the pictures first, so you get an idea of where the post is headed. There are two very interesting things about these pics, 1) they were all taken by Kaizu, raising questions about a possible Maskman tribute episode, and whether or not Kaizu has come out of retirement from acting to take up his old role in this new series, and 2) Go-KaiYellow is the subject of three of these pics, with two featuring Ichimichi Mao and one with the Go-KaiYellow suit actor. Either this possible tribute episode has something to do with Luka, or someone really likes Ichimichi Mao. For the sake of this post, let’s go with the former. Author M.F. CalhounPosted on August 28, 2011 August 28, 2011 Categories MC's postsTags cast pics, Georgette Inaba, Go-KaiYellow, Ichimichi Mao, Izumi Shuihei, Kaizoku Sentai Go-kaiger, Kaizu Ryousuke, Maskman, Ohranger, REAL PICS, rumors, Satou Tamao, Timeranger, tribute episode1 Comment on Red Mask Comeback: Is Takeru returning in Go-Kaiger? New henshinGARB mini catalogue: Go over time and space! Here we have the whole Timeranger/Time Force team, including TimeFire/Quantum Ranger. Their personal insignias have been “airburshed” onto these tees, giving it that personalized, homemade feel. And you gotta admit, it looks cool, right? They’re available in the colors shown above, and in mulitple sizes. The men’s standard weight tees (red, blue, green, fire/quantum) are available for only $12.00, the men’s heavyweight tee (yellow) is $16.00, and the two women’s slimfit AA tees (yellow and pink) are only $19.00. Now you can have AkaRed’s head printed on your chest where ever you go! These sleak red tees bear the resemblence of the cult favorite warrior, and are available for only $12.oo (multiple sizes, same price for men’s and women’s). And finally, we have the SunVulcan Tees, guess where these designs come from. Available in the colors seen here, and in multiple sizes, the men’s tees are $16.00, and the women’s slimfit AA tees are only $19.00. Currently, we also have the SunVulcan logo available in button form for only $5 for a pack of five. And you can only find these amazing products at henshinGARB! If you like any of this, or would like to see what else we have available, you can either click the link in the post, or click the link in the blogroll, under the category “Stuff I actually have anything to do with”. Author M.F. CalhounPosted on July 4, 2011 Categories MC's postsTags AkaRed, catalogue, henshinGARB, Megaranger, new products, Power Rangers in Space, Power Rangers Time Force, SunVulcan, TimerangerLeave a comment on New henshinGARB mini catalogue: Go over time and space! Go-KaiSilver revealed! : Who the heck is this Gai? Yes, this is Go-KaiSilver in his Gold form, with the special AnchorKey he uses to change into this form. And we can officially say that the character Gai Ikari (Once again, I’m guessing it’s Guy Ikari) will be Go-KaiSilver. It seems that, like a lot of us, Gai is a human who has loved Super Sentai his entire life (in case you’re wondering, I mean that he is from Earth, wha a twist!). One day, he save a girl from a car accident, saving her life but getting badly injured himself. He passes out and meets AbareKiller (as Mikito), DragonRanger, and TimeFire in a dream. They were so impressed by his heroism that they consider him worthy of becoming the sixth Go-Kaiger and give him the Go-KaiCellular and the Sixth RangerKeys, to which he is very excited to recieve. He joins the pirate gang so that he can fight Zangyack and bring peace back to Earth. Well, he may still be a couple of episodes away, but we’re all still super excited about it. And he’s already a history maker. For one, he is probably the first senshi to have two standard forms from the beginning, and his personal weapon, Go-KaiSpear, takes the multi-weapon concept to another level. And of course, let’s not forget about his personal robo, Go-JyuJin. Go-JyuJin has three different forms: Go-JyuDrill, Go-JyuRex, and it’s final robo mode. In it’s final robo form, the drill acts as it’s left arm, and the Tyrrano head acts as it right arm. Very similar to AbareMax, but the head and tranformation makes it look more like V-Rex Robo. And it’s rumored that it will be able to swap arms with Go-KaiOh, but no word on any gattai between the two. Is it just me, or does this guy just seem to work in threes? The main rumor is that he will pop up in Ep.17, and that it will be a tribute episode to either Zyuranger or Timeranger. More should be revealed as we get closer to the date. BTW, the week after Go-KaiSilver premieres, there won’t be any new episodes of either Go-Kaiger or Kamen Rider OOO, there is a scheduled break then. UPDATE: (5/24/11) More Go-KaiSilver scans have been leaked, let’s take a look. Ooh, you can see the actual Go-KaiCellular in this one! And his personal RangerKey, too! And this is Go-JyuJin in Robo mode. You like this one any better, PaladinZeo? ‘Cuz I think it looks badass myself. And this is Go-JyuJin in Go-JyuDrill and Go-JyuRex mode. And probably the only pic I’ve seen so far of Go-KaiSilver in his standard form. Seriously, go look at the other pictures, there almost all of him in Gold Form. That’s it for now, if any more pop up, you know what to do. UPDATE: (5/25/11) Hey, nothing else has really popped up, but I just forgot to mention that episode 17, the one Go-KaiSilver will premiere on, will be a tribute episode for three Sentai series. It will be a tribute to Zyuranger, Timeranger, and Abaranger. 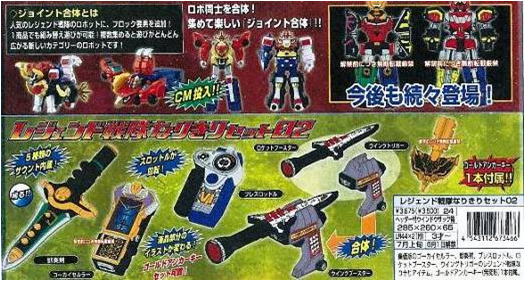 And this is expressed in the different modes that Go-JyuJin goes through: the Drill mode represents Timeranger‘s grand power, Rex mode represents Zyuranger‘s grand power, and the Robo mode will represent Abaranger‘s grand power. They’re taking out three birds with one stone. Author M.F. CalhounPosted on May 23, 2011 May 25, 2011 Categories MC's postsTags Abaranger, Go-Kaiger Goseiger Super Sentai 199 Heroes, Go-KaiSilver, Kaizoku Sentai Go-kaiger, Super Sentai, Timeranger, Zyuranger1 Comment on Go-KaiSilver revealed! : Who the heck is this Gai?